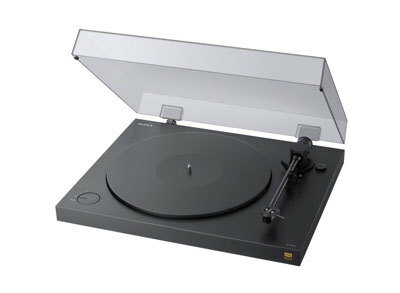 As the global resurgence in vinyl continues, Sony has announced a new premium turntable that enables vinyl owners to enjoy their favourite tracks in outstanding quality, even when on the move. In a world first, the Sony PS-HX500 allows you to convert your vinyl collection into High-Resolution Audio quality digital files (equivalent to DSD quality) so that you can enjoy their unique sound wherever you may be. Made for music lovers, every area of the PS-HX500 is designed to deliver the best possible sound quality and treat your vinyl with the respect it deserves. From a newly developed tone arm to the die-cast platter and the plinth itself; every component has been carefully considered to deliver a great musical performance. The straight tone arm, designed with the stylus tip located in the central axis of the arm, ensures excellent stereo balance. The arm also features an integrated round head shell that minimises resonance, for pure sound reproduction. An anti-skating device is incorporated into the arm assembly, along with an arm cueing system. A moving magnet cartridge is supplied with tracking force and balance easily adjustable. The PS-HX500 has an aluminium die-cast platter and is belt driven by a two speed motor. A high density 30mm acoustic plinth is featured, along with a newly designed, 5mm rubber mat and four insulator feet. A classical approach to turntable design, from years of past experience has produced a model which can satisfy the music enthusiast. Record enthusiasts can sometimes be faced with the prospect of inferior digital files of their analogue records for listening on the move. The PS-HX500 comes with a high quality DSD native converter, which gives the user the option to copy their favourite analogue tracks to a PC as a digital file, up to High-Resolution Audio quality. This allows the user to take their favourite music from their vinyl collection and play it on a compatible PC, mobile, portable music-player, or even in their car. The record player also comes with an integrated phono preamp, allowing direct connection to an external amplifier for high-fidelity home audio playback. The PS-HX500 is the world’s first turntable to support Double-rate and Single-rate DSD (5.6MHz/1bit, 2.8MHz/1bit), a powerful audio format that will reproduce your music with both accuracy and natural musicality. Furthermore, the AD conversion process can offer a choice of file quality from WAV, to High-Resolution Audio with higher bit rate and sampling frequencies, through to double-rate DSD. Users can therefore not only enjoy their records wherever they go but also appreciate them in superior sound quality. Using the PS-HX500 PC application software, a vinyl can easily be converted to High-Resolution Audio files on the user’s PC and edited in post-production. The compatible software app is simply downloaded and after connecting the computer to the turntable, the recording process is quite simple. Tracks can later be edited, titled, cut, or combined together, allowing users to be truly creative with their music.